SEJONG, Dec. 4 (Yonhap) — South Korea’s finance minister nominee pledged Tuesday to take preemptive steps against internal and external risks amid concerns over an economic downturn. Hong Nam-ki said that the government will keenly monitor household debt, real estate prices and a trade dispute between the United States and China. He added that Seoul will also keep close tabs on increased financial volatility. South Korea’s household credit surpassed 1,500 trillion won (US$1.33 trillion) in September, continuing its record-breaking pace. 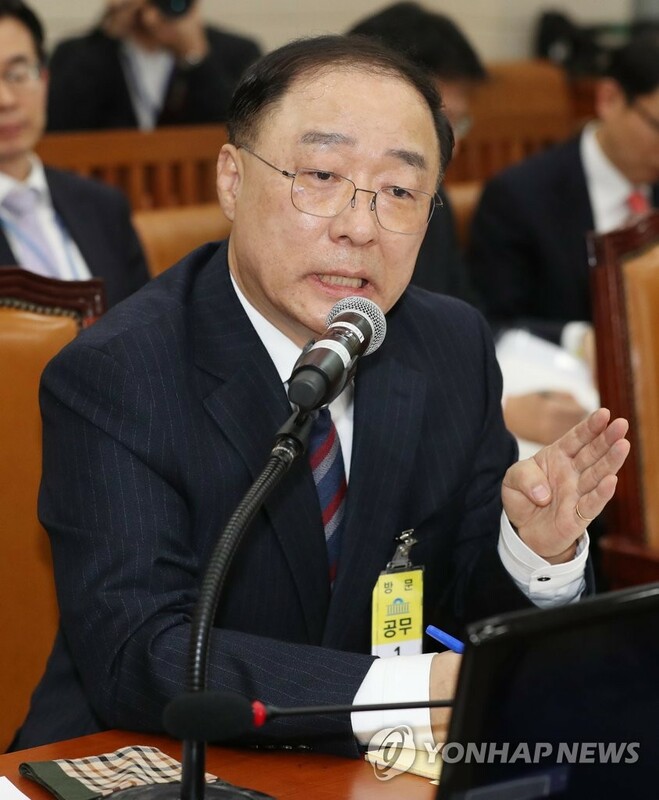 Hong — nominated by President Moon Jae-in last month to lead the Ministry of Economy and Finance — made the comments at a parliamentary confirmation hearing. In South Korea, prime minister is the only Cabinet post that requires a parliamentary approval. Hong also vowed to retain the “income-led growth” policy and pursue inclusive growth to address polarization and low economic growth. “Income-led growth” is President Moon Jae-in’s trademark economic policy and calls for increased income and spending by households to generate growth in the country. The policy is centered on higher wages for workers. In line with the policy, South Korea raised its minimum wage to 7,530 won per hour at the start of the year, up 16.4 percent from 2017. The minimum wage is again set to jump 10.9 percent to 8,350 won per hour at the beginning of next year. Hong said the government will decide future minimum wage adjustments next year by taking into account its economic impact. Critics claim minimum wage hikes have increased burdens on businesses, especially mom and pop stores. The nominee said the government can consider raising taxes if a tax hike is needed to cover welfare costs and there is public consensus on the issue.